Are you looking for the best & most affordable lawn mowing services in Cedar Park, TX? Visit GoMow.com to select from different Lawn Maintenance Service Plans available to the residents of Cedar Park. Call us today at 800-601-0669! Residential Lawn Mowing in Cedar Park, "You Click,We Cut"
Are you in need of best and affordable Cedar Park Lawn Care? You are at the perfect place. GoMow is honored to offer lawn care and lawn mowing services to Cedar Park residents. Click here gomow.com to select from one of the many different Weekly & Bi-Weekly lawn mowing service plans available to the residents of Cedar Park and have GoMow maintain your lawn today! Cedar Park is home to the famous 400-year-old Heritage Oak tree which is located at the median on Quest Blvd in Cedar Park. 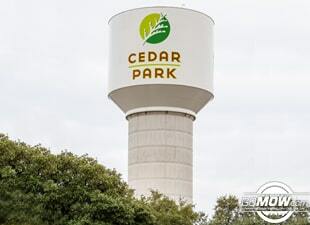 Because of this glorious landmark, the residents of Cedar Park pay close attention to vegetation around the city, including carefully maintained lawns and flower beds. Take a walk through the streets of Cedar Park and enjoy the scenic vistas of green, which contribute to the natural rustic experience this city holds. Lawn care in Cedar Park becomes challenging when you give mother nature her space. This is largely attributed to pests and insects, which ravage many of the lawns within the city. While weeds seem to be the biggest challenge for most Cedar park residents, Armyworms in Turf grass, Chinch bug and White grubs seem to pose the most threats for Lawn Treatment in Cedar Park. Are you ready to maintain your Cedar Park lawn by professional lawn mowing services? Sign up today at GoMow Lawn Care services & Get a FREE QUOTE. I asked GoMow to clear some weeds from my flower beds - the vines and prickly weeds had taken over and it looked very unsightly. They did a wonderful job - not only removing the ghastly weeds, but also trimmed the bushes and now it looks perfect! Very happy with the "Bush crew"'s work. Residential lawn mowing and bush trimming service near HEB Plus. Provide yard mowing and yard leaf clean up. Pass New Hope PDN Park to arrive at the affordable mowing service customers address. Residential lawn mowing and yard work near the Lakeline Mall area. The customer would like a bush and bed estimate on the beds around the front yard. Lawn home improvement and mowing next to Cedar Park High School football field. Near Park Place Volvo...Lawn cutting and grass cutting for this customer. Organic lawn care and lawn service. Mowing service near Anderson Mill West. Recommend leaf clean up and removal. Pass Cedar Park High School to get to this residential lawn care customer. The vegetation on the back side of garage needs trimming. Affordable lawn care and mowing service near Anderson Mill West. Perform yard work for customer. Pass Buttercup creek neighborhood to get to this address for Lawn Mowing and lawn care. Near Vista Ridge High School, give the customer a quote for Lawn Care Maintenance and mowing. The bushes in the alley need to be trimmed.